Ever since we came back from our adventurous trip to north Wales (more of it in coming posts, hopefully! ), we have hardly been entering our kitchen except for heating the food in microwave. Simple Dal and Rasams is all we managed to cook when it became too agonising to even lift a spoon after all those adventurous sports. Well, all that climbing, biking, and walking seemed like a good way of relaxing at that time, but at present I can’t help but think that we may have overdone it when I try to walk without limping with back and leg pain! Tired of eating same dal and rasams with rice for last few days, we set out into making something of a treat to ourselves to cheer our taste buds. With few sad looking potatoes in a pantry and a bag of wilted baby spinach on the verge of committing suicide if it was not used in a day or two, I decided to cook much loved Punjabi dish called Aloo Palak. 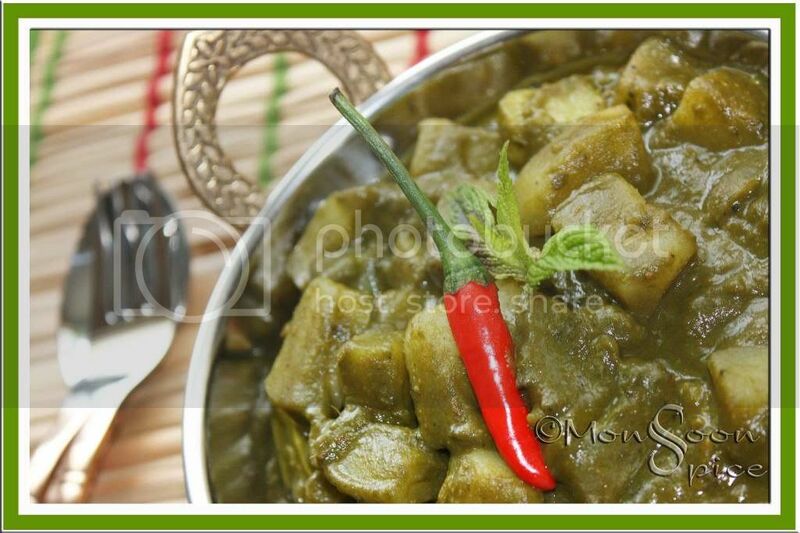 Aloo Palak, delicious gravy of spinach with tender potatoes doesn’t need any introduction. For me Aloo Palak is a dish which serves as a benchmark for many good cooks/chefs at home and restaurants. Like many other recipes in India, Aloo Palak can also be cooked in many ways using as little as 5 ingredients to as many as dozens of ingredients. Sometime you will be served Aloo Palak in a gravy form or simple stir fried form. But whatever way it’s been cooked or served, it remains to be one of the most loved Indian foods among many foodies. I have been cooking this dish for around 3 years and at last I can say that we have found the recipe which we love the most. The base gravy is little thick due to addition of cashews which not only thickens the gravy but gives it little nutty and wonderful taste. With cashews, I add wee bit of dried fenugreek leaves which gives it very pleasant bitter taste along with extraordinary aroma and flavour it imparts. Both these ingredients are optional, and I don’t think they are used in a traditional recipe of Aloo Palak. But at the same time, these two ingredients add that oomph factor to my recipe of Aloo Palak. So try this recipe when you want to cook little different Aloo Palak and enjoy the whole goodness of greens this winter. Heat about ½ tbsp of oil in a pan and add cinnamon, green cardamom and cloves. Sauté it for few seconds and add ½ tsp of cumin seeds. When cumin seeds start to sizzle and turn golden red, add cashews and green chillies. Sauté it on medium flame till cashews turn light golden brown in colour. Mix in roughly chopped spinach, sugar and cover the lid. Cook this spinach cover for few minutes on a medium heat till it is wilted. If needed sprinkle little water in between to avoid them sticking to the pan. Cool the mixture and grind it to smooth paste with mint leaves adding as little water as possible. Keep aside this mixture till required. Heat ½ tbsp of oil in the same pan and remaining cumin seeds. When it starts to sizzle, add finely chopped onion and sauté it for a minute. Now add ginger-garlic paste and sauté it till the raw smell disappears, about a minute. Mix in chopped tomatoes and sauté till it becomes pulpy. Add kitchen king masala, garam masala and kasuri methi and keep stirring till nice aroma of masala fills the kitchen, about a minute. 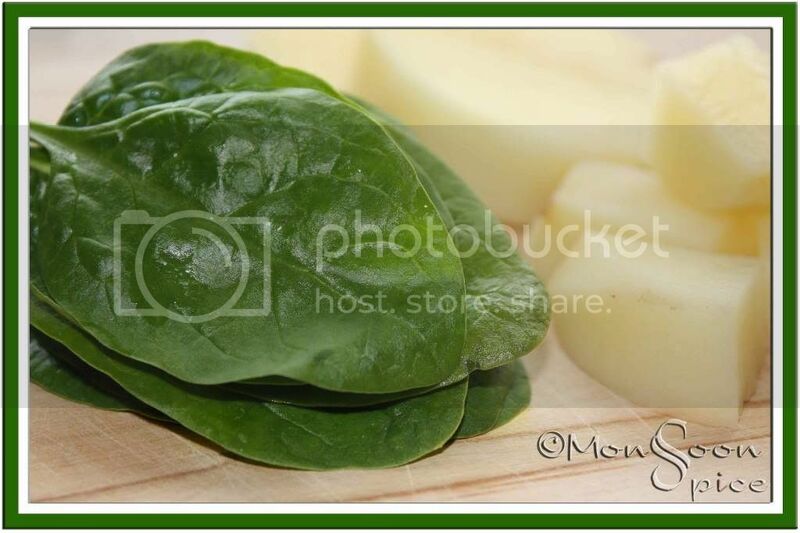 Mix in ground spinach paste and add about 1- 1½ cups of water and salt to taste. Let it cook on a low to medium flame for about ten minutes. Add cooked potato pieces and amchur powder to spinach gravy and mix well. Cook for another 5-10 minutes so that potato absorbs all the flavours. Serve this Aloo Palak with any Indian bread of your choice and enjoy. The dish looks awesome with a ripe orangish red chilli, good photography and recipe too. Looks delicious! And u cooked this with paining legs and aching back ? U're real Angel dear! Wales is simply gorgeous, isn't it :-) Which place did you go to? Paneer palak is something which i have in India when i go fo dinner. I have never made them. Love the combo... and ur Header... Cant take my eyes of it. Both are awesome, Sia. looks fabulous, sia. will try it soon. Looks lovely Sia. Overdoing during vacation is expected so don't worry and take care of that back and leg. Another different way to eat palak! It should be tasty with rice! wow..nice new header!...looks fantastic....and aloo palak is yum! Hi, this is such a wonderful variation, the addition of cashews. I add a lot of roasted methi seeds powder, but will try it with dry methi leaves next time. Infact, I made this last week, and am yet to post. I do have a question here: I have been told by many not to use tomatoes with palak. I have been avoiding the use of tomatoes with green leaves (any), and if I do need the tanginess, I use a whole or half lemon's juice, as I do for Aloo palak. After I started blogging, I have seen so many recipes with tomatoes in palak, and I keep wondering if I am totally misinformed/ misguided here. Please help. Thanks:-) Looking forward to more Wales stories here. Sorry for the lengthy comment! i normally have shredded spinach in my aloo palak and not the creamy variation. should try this too, especially with the cashews! Sounds good and lovely picture as usual! Sia looks so nice.. i love this combo rather than Paneer as i dont like paneer. This one is indeed a delicious treat! Some holidays tend to be like that:) Just take care and relax! When you absolutely can't bring yoursef to spend time in the kitchen, try out these quickie, one pot meals, which have rescued me numerous times ! And yes, they cook a lot faster than dal / rasam. I love this combo! You're tempting me! ooooh, Yummy! 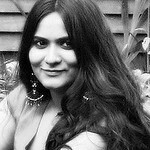 Hi Sia Ur blog is really cool...an award is waiting for u . Pls check. Cashews, kasuri methi and kitchen king masala are indispensible in your recipes :) I make a light, homely version with tomatoes and a richer, creamy version of this on occassions. Will blog about it sometime, hopefully! Looks lovely Sia! I've been enjoying your Rasam recipes lately what with this grizzly cold weather descending upon us!! such a great blog , i am going to link you to my account i hope you dont mind. you have great recipes too , will try some and let you know. I also add a bit of kasuri methi to mine but never tried cashews or Kitchen King masala. i too have heard abt it but i am not sure how true it is. thank you girls for the award :) i really appreciate it. Aloo palak looks so yummy.. lovely color. Yum! 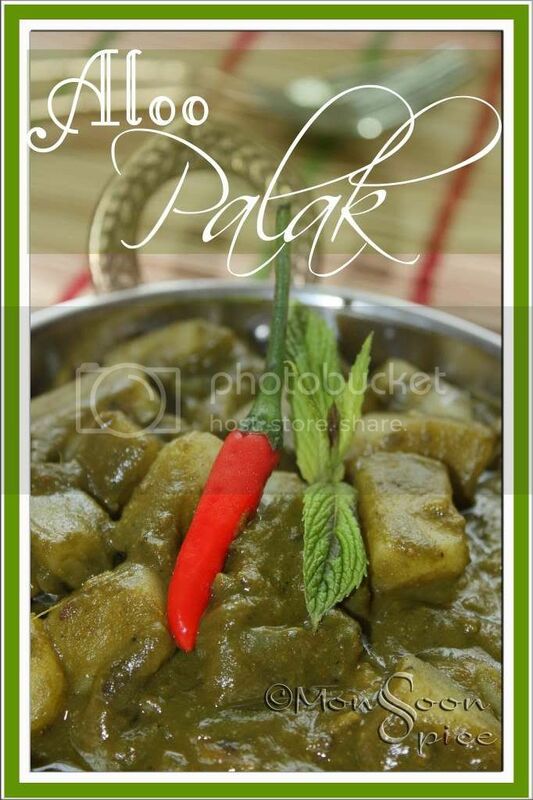 I've never had Aloo Palak, but after reading your description I must try it!! Looks delicious! Tried this out today but make palak paneer. I had never tried cashewnuts, kasuri methi etc. in my palak paneer. Loved it. Can I use your post for my version? We also make Aloo Palak in gravy form, but we add dried raisins and peaches to make it sweeter. We also roast the potatoes first and it's amazing.